At MarketingExperiments, we use patented heuristics to evaluate websites, emails and other digital mediums. Often people think that a heuristic evaluation is a purely qualitative approach to a problem. This can be true, but when you combine quantitative analytics with the qualitative knowledge you increase the power to make meaningful change. This post will show relevant metrics for three of these elements that any marketer — from beginner to advanced — can use to discover opportunities for improvement. Often people just ask for data dumps. To make matters worse, they want it in a very short time. On top of that, most data scientists use purely what they are comfortable with: numbers. To add context and save time, you must evaluate the site to see where you should focus your data analysis. Put yourself in the customer’s mindset and go to your site. If you own creative or design, try to remove those biases as best as possible. What makes sense to you or feels like the right amount of information may be completely overwhelming to a customer who isn’t familiar with your product or industry. Look for things that are broken, functions that are clunky, images that don’t make sense or add value and difficulty in completing the conversion. You must objectively look at all the pages in the conversion path and be familiar enough with them to make sense of the data that you pull. Pull data to illuminate the points you saw to give validity to the theory. Key heuristic elements and data help prove the problem. Motivation cannot be affected, but it can be matched. Use the traffic reports below to determine who is coming, how they are coming and why they are coming. The source is the specific place where the traffic originated and the medium is the type of traffic. Google is an example of a source, and the medium would segment this traffic by direct, organic, paid, email, etc. User brand awareness — Having more organic than paid traffic can mean users already know you and your products. Email — Users are on a list and have engaged with you before. Match the motivation of search traffic by looking at what keywords were used to find the link to your site. If the majority are branded, then you can spend less real estate on your site telling people who you are with primary level value proposition. If the majority is nonbranded, then you know you must put value proposition about your company and products directly in the customer’s eye-path. Look at the landing pages people visit most often, and look at the bounce and exit rates. If these are high, you haven’t aligned with the motivation of the visitors. It is important to use value proposition in the right place to increase the perceived value of the offer as you increase the perceived cost — which could be taking action or giving personal information. Look at pages such as “About Us,” “Contact Us” and “FAQ” and run a previous page report. This will show you where visitors need more value proposition to keep them in the funnel. You can take it a step further and see where visitors went next by running a Next Page Report, which shows the areas where customers needed more information. Find your top exit pages and then look at them to see if there is value proposition on those pages. If there isn’t, then add the appropriate value proposition. If there is, maybe the value proposition needs updating. This update could be as simple as changing where it is and what it says. 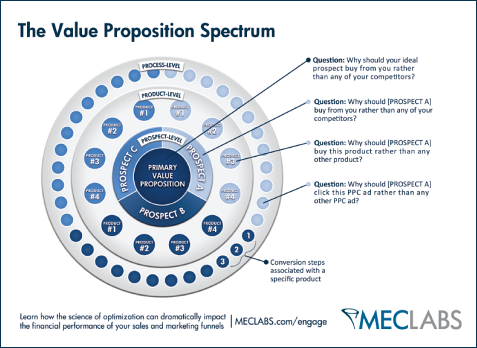 To understand what goes into a proper value proposition, review these five questions from a MarketingExperiments interview with Michael Lanning, the inventor of the term. Often I see websites where the value proposition is on the page, but it is too low on the page or too outside the eye path to ever be seen. See how far people are scrolling on your pages to determine the placement of your value proposition. Look at responses of customers to determine the best and worst aspects of your product(s) so that you can highlight the best and message against the worst. Also, look at your competitors and compare products so that you can highlight why your product is the best for the potential customer. Friction is the amount of effort someone has to give to complete a conversion. Look at the key funnel steps and run these reports. Every website has many friction possibilities, so focus on those specific to you. 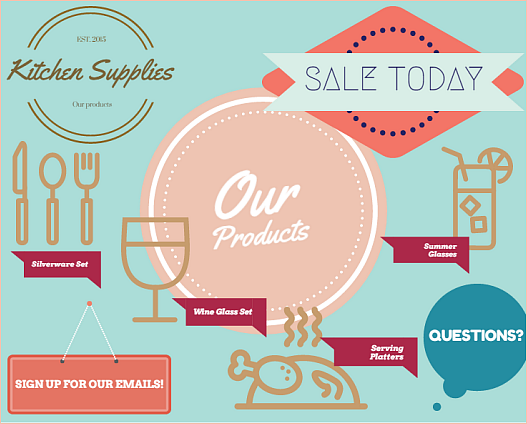 Look at form fields, product pages, carts, calls-to-action and other places that may be difficult to navigate. “Previous” and “Next Page” reports are a great way to isolate friction. If you see that a high rate of visitors are bouncing between steps or between the cart and shopping, then some element of friction is most likely causing them to not want to complete the step. If people are going to the “Contact Us” page at the same point repeatedly, then they most likely have had enough with trying to complete the purchase online. Set up events or click tracking to help identify friction (especially at places where people enter information). If you see a high drop off rate at a particular part of the checkout, then the friction has overwhelmed the visitor. You can test shortening or removing information or explaining why the information is necessary. Internal search traffic can also be used to help identify friction in the purchase process. If common search terms are product related, it is too difficult for the user to get the relevant information they are seeking. If it is mostly related to process, then you can address those elements in the purchase path. In this MarketingExperiments Blog post, learn how National Instruments tackled a data management challenge and extended an effective, transparent data management approach across the enterprise. Blog Analytics: How do you measure the company blog’s performance?